Park didn't want to like Eleanor. He wanted to sit on the bus and mind his own business. No sudden movements. Keep to yourself and the kids at the back of the bus will leave you alone. Eleanor didn't want to like Park. She was already living on the edge at home. Bringing attention to herself at school was the last thing she needed. But Park needed Eleanor, and Eleanor needed Park and slowly their worlds collided. This was, by far, the most poetic book I've ever read. Rainbow Rowell knows exactly how to weave words together so they flow across the page and stick in your head. Every time Park touches Eleanor, and every time Eleanor sees Park, you feel it in deep in your heart and ache alongside them. 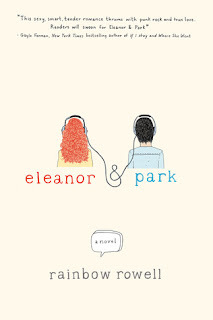 Eleanor and Park is the story of first love, but it is also a story about family. We get a glimpse of poverty and choice in Eleanor's family and love and forgiveness in Park's family. The fact that the two find each other despite their very different backgrounds might not be miraculous, but that they let each other in is. Eleanor could have very easily become a loner, shutting the world out, but she didn't. And Park could have very easily succumbed to peer pressure and joined the others in making Eleanor's life even more miserable, but he didn't. Once again, this has nothing to do with the story itself but my own prejudices. I read to escape, and while reading books that mirror things I see on the news or in my library's Teen Room every day, I tend to put up a wall and keep myself for really caring about the characters. That was my barrier with Eleanor and Park. Every day I hear stories from teens that are sadly similar to Eleanor's, and I see the bullying and intimidating that both characters endured. I couldn't make myself really love the book. So it's okay to appreciate quality literature and talented authors without really loving their books. That is my relationship with Eleanor and Park. If you want a romance with substance, that tackles tough issues, and that is exceptionally well written, pick up Rainbow Rowell's Eleanor and Park.